Thanks to our good friend Carol over at My Bell Ringers, my "Darth Vader Explains the Pythagorean Theorem" YouTube video has been linked by a columnist at the London Times!! This week's Carnival of Education is brain-based, and it's being held over at Sharp Brains right now! Go check it out to see all the great articles, including my quick hits on the first day of school. The girl who is obsessed with my hair remains obsessed. She hasn't asked any more probing questions about it, but every time I talk to her, I can tell she is looking at the top of my head. I think I can relate to how buxom women feel when eyes are directed elsewhere. "Excuse me, my eyes are down here!!!" School has already started, but this week's Mr. Teacher column on education.com is titled Practice Q&A, and it is intended to be an aid to parents for getting their kids ready for going back to school. Teachers ask a lot of questions -- the kids need to have their answers prepared. One day of the '08/'09 school year is now under my belt, and another exciting nine months begins! I actually woke up at 4:30 this morning and took a walk around my neighborhood before getting ready to go to school. I also had a dream last night where I had gotten out of bed, looked out my window, washed my hands, and headed back to the bed -- only it turns out I had never gotten out of bed in the first place! Analyze THAT, Sigmund Freud! All weekend long, I had been dreading my early morning crosswalk duty. The city of Dallas has been doing some construction on the street that my school is on, and part of one lane is cordoned off, which requires people in that lane to pull into the opposing traffic lane to get past it. But picture of this situation could appear in any dictionary under the word, "bottleneck." Amazingly, there didn't seem to be any bottlenecking this morning. There was a police man in the area keeping an eye on things, but he wasn't directing traffic around the obstacle. People just seem to take their turns and work around it. Impressive, to say the least! During morning duty, I saw lots of my kids from last year, and now that I'm not their teacher anymore, I can pal around with them quite a bit more. I also saw several kids that were familiar from parent drop-off last year who walked past me and informed me that they would be in my class THIS year. As is always the case on the first day of school, there was mass chaos at first, with all of the parents and kids trying to figure out where to go. Nobody was actually in the classroom before 8:30. A lot more kids should be showing up soon, because I only had 11 kids in my homeroom and eight kids in my second class. Those eight kids in the afternoon were very well behaved, but it was like pulling teeth getting them to answer ANY of my questions. Some of my kids are either VERY shy on the first day of school, or they are very low mathematically, because when I asked them what eleven minus five was, they stared blankly at me like I had just asked them to spell the rising agricultural capital of central Micronesia. The mother of one of my homeroom kids talked with me briefly this morning about how her son is "severely ADHD," and how she had just taken him off of his medication. I can't really blame her too much, because she said that the medication had basically turned her son into a zombie. But I hope that she's working closely with a doctor somewhere to find a comfortable middle ground. While discussing safety in science, one boy told me that you should wear safety goggles while "mixing potions" so they don't splash into your eyes. I was so tempted to say, "50 points for Slytherin!!" While discussing a word problem that required subtraction to find a solution, potions boy also told me that he thought we should add on that problem because, "adding is good, and sometimes subtracting is not good." Oh, and I have FOUR girls in my classes with the same name. All in all, a pretty good first day! I would absolutely LOVE to keep my class size as small as it was today, but I know it will increase in the next couple of days. So, how did everyone else's first day go?? Tomorrow is the first day of school for all of us Texas public school teachers, and I know we're all running around like chickens with our heads cut off (a favorite saying of my old high school basketball coach, The Guam Bomb). So just a quick little note here. Today and tomorrow are the last days to take advantage of the 25% discount that Spreadshirt is offering as part of their Back to School special. If you buy at least two shirts and use the code SCHOOL108, you get them for 3/4 price! A few of my teammates suggested that we get some of those shirts in our school's color to wear on the first day of in-service and show third-grade team unity. We wore them last Monday, and everyone at the school loved it! 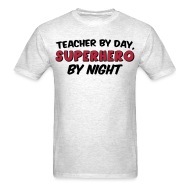 In fact, my principle even said that we can wear those shirts when we have casual Fridays! The eight of us wore the same color, but we all had different phrases. 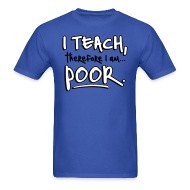 I was of course wearing the, "I teach, therefore I am... poor," my partner was wearing, "No, Johnny, a 50 is NOT a good score," and the others wore shirts that said, "I love the smell of crayons in the morning," "No Child Left Befuddled," "Thank God for recess," "Don't fear the teacher, baby," "I'm taking a mental health YEAR," and "Lesson plans? We don't need no steeeeeenkin' lesson plans!" Who knows? Get them in YOUR school's colors, and maybe you can wear them on Fridays as well! An award and a guest book! A little while ago, AwayWeGo at Where's the Sun nominated me for a blog award -- The Brilliante Weblog Award! I am very honored to have this honor bestowed upon me, in my honor, Your Honor. According to the rules of the award, I need to pass this honor on to seven other blogs, so let me just go ahead and get the nominations started. I always like to know where people are visiting this blog from, and who is reading my stuff (not to mention who keeps leaving the cap off the toothpaste), so I would ask you all to sign my guestbook! I've just installed a brand new "slide" guestbook at the bottom of this page, so please go there, and tell me where you're from, what you teach (or what you do), and something interesting about yourself. Figured the weekend before the new school year started was a perfect time to call roll. Today was a fracking long day. I felt like a hamster on a wheel -- dead tired, didn't very far, and smelling of wet fur. So much still to do, and only tomorrow to do it in! Will my room be ready by Monday??? 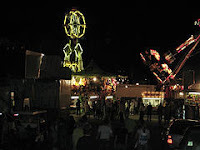 Convocations and Carnivals, oh my! 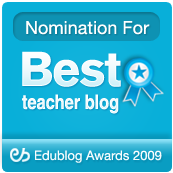 This week's Carnival of Education is being hosted at my fellow Dallas teacher's blog -- Bell Ringers! Lots of great articles to choose from over there, including the chance to see if you are smarter than an eighth grader, the opportunity to agree or disagree with dress codes in school, and even a second chance to see Darth Vader teaching the Pythagorean theorem! Today, all teachers in the Dallas ISD (at least all teachers not feigning illness or playing hooky) attended convocation at the American Airlines Center. If you've ever been to a sporting event at a major stadium or arena, then you know it can be a bit difficult to navigate parking, seating, etc. And most sporting events are held on weekends or in the evening, so attendees usually don't have to fight rush-hour traffic to get there! Not wanting to mess with traffic at all, I met up with some of my fellow teachers at the school, and we made our way to a nearby light rail station to take the train in to downtown Dallas. The trek wasn't too bad, and we didn't have much trouble getting to the AAC. Two years ago, when we had our convocation at the AAC, the keynote speaker was some guy who called himself "AKA Dr. Attitude." Yes, I do believe that the AKA was officially part of his moniker. He was all right, I guess, but he struck me as being super cheesy. This year, you can imagine my surprise when the superintendent introduced the keynote speaker, and a tiny little kid walked out onto the stage. This kid, a fifth-grader at a Dallas school, spent the next 15 minutes or so doing his best preacher routine. And I gotta say, it was pretty spectacular. He had obviously practiced hard on his cadence and enunciation, and his major theme was, "Believe in me and my classmates." To the wild applause and support of all in attendance, this young man entreated us to see the full potential of the kids in our class, regardless of background, attitude, or behavioral issues. He really brought the house down. Any other Dallas teachers out there, weigh in! What do you think of today's events? This week's Mr. Teacher column on education.com is titled Teacher in a Strange Land, and it's a short recounting of my first trip back to my school last week. I've moved into a brand new room for this year, and it's taking me a while to grow accustomed to my surroundings, to say the least. Enjoy, and Dallas teachers, let's rock the AAC tomorrow!! WOOHOO!!! Dude, you gotta, like, check this out, especially if you, like, teach in Dallas. I'm plugging a book BESIDES my own!!! Kelly Curtis, who writes the blog Pass the Torch honored me by sending me an advance copy of her new book, Empowering Youth: How to Encourage Young Leaders to Do Great Things. On the back cover, she poses the question: How do you bring out the power in young people? Throughout this well-written and fascinating book, Curtis explains how important it is that kids be given opportunities to thrive, and she gives examples of situations where youths have led projects, founded charities, and contributed memorably to their communities. Interwoven with these stories is the underlying message to adults who come into contact with young people that we need to be "asset builders." Curtis lists 40 Developmental Assets -- factors that are instrumental in benefiting youths. These Developmental Assets include a caring neighborhood, adult role models, and positive peer influence. Adults tend to categorize youths as either objects, recipients, or resources. As objects and recipients, youths have no hope of sharing in any kind of decision-making. However, once adults begin to view youths as resources -- to value their input and actually use it -- great strides can be made towards a successful future. While further training is available to adults who want to learn more about empowering young people and encouraging involvement, Curtis reminds readers that starting down that path is easy. Just make eye contact and smile at kids! Additional features inside Empowering Youth include detailed activities that involve kids and adults, and a series of reflection questions. 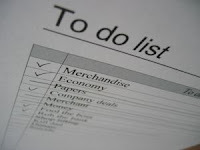 There are also checklists that can be used to gauge current levels of empowerment. Empowering Youth is a wonderful resource for anyone wanting to motivate, foster, and support young people of all ages. For anyone needing a reason, in the introduction, Curtis offers a quote from Mary Patterson of Project Cornerstone: "People never recall the bicycle, but who taught them to ride it. They don't recall the basketball game, but who taught them to play it. They don't recall the English class, but who taught the lesson." Curtis then adds, "Be the who." My last somewhat creative project of summer vacation is finally complete. Inspired by last month's trip to Comic-Con, I decided to smash up my love of all things math and all things Star Wars and create this video -- Darth Vader Explains the Pythagorean Theorem. The voiceover work is not exactly James Earl Jones quality, but hey, I did my best. If you like it, leave a comment and pass it on; if not, so be it. 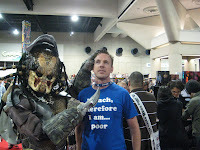 OK, so it's been long enough since I posted about my trip to Comic-Con, so I figured it's about time for me to finish the story. I've posted about every day there except for the final day, Sunday (and of course there's no reason for me to post about Monday, the day spent in the San Diego airport -- of course, if I had been there on Tuesday, I could have posted about my experience during an earthquake), so here's the conclusion to the story. So my friend and I just spent a couple of hours wandering around the exhibition hall one last time. Over at one of the collectibles booths, we found the opportunity for one last fantastic photo opportunity, with a guy in a really realistic Predator outfit. The closing event of the weekend was a screening of Once More with Feeling, the musical episode of Buffy the Vampire Slayer. I am a big fan of that show, and that was a truly great episode, so I convinced my buddy to go with me. Thankfully, it didn't turn into The Rocky Horror Picture Show. 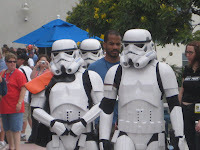 It was a fun event to watch, and I think my friend enjoyed it, even though he didn't know who all of the characters were. After that, there wasn't much else to do except head back to the hotel and start trying to pack up all of the freebies we had gotten. THAT took an hour or two, since I had to figure out what I was going to check and what I was going to try to carry onto the plane. 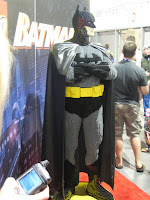 Overall, Comic-Con was a fantastic experience. If you're into that sort of thing, I HIGHLY recommend it. I don't know that I'm going to go again next year, but I will definitely consider it again in the future. For the past month or so, I've noticed through my stat tracker, that a LOT of my hits to this blog are coming from people doing a search on "Welcome Letter to Parents" or some variation on that theme. Richie at Bell Ringers tagged me last week for a meme on, as the Comic Book Dude from The Simpsons would say -- Worst. Job. Ever. I've had some pretty rotten jobs, though none that I would compare to some of the all-time worst jobs in the world. For instance, I am thankful that I have never been someone who sniffs other people's armpits to make sure deodorant is working. I have never had to pick up bat guano. I have never been a professional javelin catcher. Between my stint as a mechanical design engineer and my current profession as a third-grade math teacher, I held several odd jobs. The one that made me feel slimiest was telemarketer, where I would cold call people and try to convince them to sign up for the credit card du jour. However, my pick for worst job that I've ever held was telephone book deliverer. I saw an ad in the paper, and applied for the job. First thing in the morning, I went out to this warehouse and loaded up my car with as many telephone directories as it would hold. I then selected one of the designated routes, and drove over there to make deliveries. Unlike newspaper delivery, I couldn't just slowly drive by in my car and toss a 25 pound phonebook out the window into each yard. I had to park at one end of the street, grab as many books as I could hold -- usually around eight -- and deliver the books to each doorstep, one house at a time. Then I would walk back to my car and grab some more books. Then I would pull the car around to the next street, and repeat the process. Did I mention that I held this job in July, in Texas? At the end of the first day, I was physically drained, my clothes were massively sweat stained, and I just had to say No mas. Thankfully, when I resigned, the folks who were running the business asked me if I would stay on as a supervisor, someone who would drive around and make sure OTHERS had delivered the books where they were supposed to. Now I get to tag a few people, to share OF their stories of worst job ever. So I tag 100 Farmers, Mrs. Bluebird, Mrs. T, Happychyck, and Mamacita. What with my extensive travels lately and all, it seems I haven't entered or explored the Carnival of Education for a few weeks. This week, though, I'm back, and I'm pointing people towards Pass the Torch, which is where it is being held! My post about things to do before school starts is featured, as are several other good ones, including this discussion of multiplication vs. addition at Let's Play Math, and 101 ways to cope with teaching stress at Smart Teaching. Kelly from Pass the Torch is also a proud author of a book called Empowering Youth, which I can pridefully say that I have gotten an advance copy to read. I am looking forward to being able to review it, so order your copy now! The new year is almost upon us! Here in Texas, we've only got 2 weeks left before we have to report back to our schools, and the kids come a-knockin' on August 25! For my Mr. Teacher column on education.com this week, I thought I'd offer a few suggestions on things to take care of before the new year rolls around. Check it out, and as always, comments are encouraged and appreciated! After being denied access to the Watchmen preview, my friend and I decided to take no chances on being kept out of Heroes and Lost the next day. We set the alarm for 5:30 a.m. and we got to the convention center around 6:30. We took our positions in a line that already had roughly 1500 people in it. We learned that some people apparently had camped out overnight. Luckily, the people in line around us were pretty friendly, and we were able to while the time away (the Heroes panel didn't begin until 10:00, and they didn't start letting us into the room until around 9:30) chatting with them. 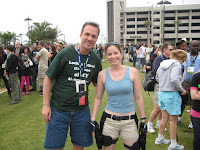 Not too far from us in the line was a pretty hot girl dressed as Lara Croft The Tomb Raider. She had some nice guns. They finally let us in the doors, and we got pretty nice seats, right around the center of the ginormous hall. 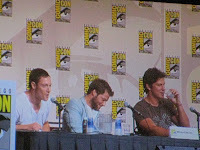 The entire cast of Heroes came into the room where they were of course met with thundering applause. My little cheerleader looked awesome, and some other favorites were there in person like Milo Ventimiglia, Greg Grunberg, and Ali Larter. Then the director came in, with a briefcase handcuffed to his wrist. He pulled a DVD out of the case and said, "I have episode one of season three here -- we're going to watch it right now!" If you are a fan of Heroes, you might want to skip this paragraph, as there are a few spoilers. The first of all, the episode was fantastic. Not a dull moment in it. Just a few highlights -- Future Peter travels back in time! Syler attacks Claire and gets her power! Hiro meets his arch nemesis, a girl with superspeed! Suresh has a power! Ando has a power! Nathan and Jessica/Nikki are alive! So is Linderman! By comparison, the Lost panel was very disappointing. Carlton Cuse and Damon Linderman, the producers, were there, and Matthew Fox showed up towards the very end of the hour, but they wasted a bunch of time on silly stuff and didn't devote enough time to audience questions. I say that because I went and got in line to ask a question myself. I was actually in the "batter's circle" ready to ask my question, when somebody broke in for a prearranged skit, and after that, the session was over. I was mere seconds away from being a part of Lost, and instead, I wound up feeling like Paolo. 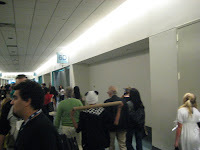 After Lost, my friend and I went upstairs to get in line for some of the other panels in smaller rooms. There was a discussion with the cast of Battlestar Galactica, led by Kevin Smith, and that was pretty cool. 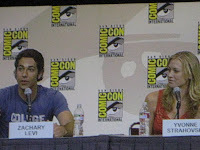 Then there was the cast of Chuck, which is really a great show. We finally went back to the hotel exhausted, and ready for the final day. Our thoughts and prayers go out to one of the greatest actors of our times. Morgan Freeman is apparently in serious condition in a hospital in Memphis, TN after a horrible auto accident. Glory, The Shawshank Redemption, and the new Batman movies are among my favorites, and Freeman is outstanding in them all. Here's hoping he recovers fully and quickly. I just want to take a second and say thank you to everyone who has taken me up on my request to ask for a copy of Learn Me Good at your local library. If the Amazon numbers are to be believed, it looks like a lot of copies are being bought. That means either people are actually buying them themselves, or the libraries are. Either way, I REALLY appreciate everyone's support! If you haven't had a chance to yet, please ask for a copy of Learn Me Good at your local library. And if you've had a chance to READ my book, please take a moment to post a review on Amazon! 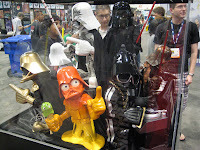 Continuing the reenactment of my trip to San Diego for this year's Comic-Con, we come to day three, Friday. This was the day that timing really started to get critical, as they were many events that we WANTED to see, but several of them were at conflicting times or in locations that were far apart from one another. As soon as we got to the conference center and I turned on my camera, the low battery light started flashing. Already I was kicking myself for not having charged it the night before. I had brought along a charger, but there just wasn't time to go back to the hotel and sit for a couple of hours while it recharged. So I tried to use the camera very sparingly. No review of photos taken. Turn it on, focus, push the button, turn it off. That worked for exactly 18 pictures. Roughly 2 hours of the morning. 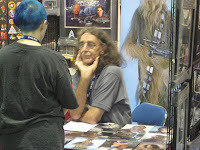 I did manage to get a couple of pictures of Chewbacca. The actor who plays him, that is, not the actual furry suit itself. There were plenty of OTHER people wearing those. Our first real disappointment of the weekend came Friday morning. Scheduled for the huge conference hall which held 6500 people was an event about Watchmen, the new movie from Warner Bros. It was scheduled for 10:50, so my friend and I headed over to the line a little before 10. The line was pretty long when we got there; I estimated there were about 1500 people in front of us, so I figured we were in good shape. By the time our line had wound around some, and we were close to the building itself, there were easily 3000 people behind us, so we were feeling sorry for them. With about 20 people between us and the door to the hall, a staffer came by to announce that the hall was full, and no one else would be allowed entrance. We later found out that they showed bits of the movie, and everyone got a free Watchmen T-shirt. Oh well. Since we missed out on Watchmen, we headed upstairs to the other screening rooms, where we had the choice of a Joss Wheedon discussion or a "Visionaries" panel consisting of the directors of several TV shows including Lost. My friend was already set on the Visionaries panel, but I had decided to see Joss. That was, until I saw the line. Both events were more than two hours away, but the line for Joss Wheedon was already humongous. Having just missed out on something despite standing in a long line, I was not anxious to do that again. So my friend and I both went to the room where the Visionaries panel was to be held. I don't even remember who was there when we first entered the room, but we sat through his discussion. Then we sat through the panel discussion with the director and voice cast of the new Spiderman animated TV series. That was pretty cool. Right before the Visionaries panel was to begin, I exited through a side door to use the restroom. On my way back, Stan Lee walked right past me. In case you don't know who that is, Stan Lee is the creator of many comic book heroes, including Spiderman, the Fantastic Four, and the X-Men. I flipped on my camera, and took a quick shot, catching the back of his head. Then I thought it would be a good idea to run ahead of him and get a shot of his front. I got set up for the shot, pushed the button, and the screen went blank except for the words, "Recharge Battery Pack." The Visionaries panel was a lot of fun. The two guys that produce Lost were there, along with the producers of Chuck, Pushing Daisies, And the Sarah Connor Chronicles. These are all shows that I watch and enjoy, so it was a very entertaining hour. It sure would have been nice to have my camera ready though later in the evening, when Kiefer Sutherland and several other members of the 24 crew had their panel discussion. At one point, I was actually about 5 feet away from Jack Bauer himself, and I got some really crappy pictures on my camera phone. They showed a few clips from the 24 mini-movie that will serve as a prequel to season seven, and it looks great. Then they had some questions from the audience. Kiefer immediately obliged with a trademark Jack Bauer dammit. He then answered the question saying that since the network won't allow profanity, he needed to come up with some sort of expletive that would adequately express his frustration on matters ranging from not being able to control his 16-year-old daughter to having the potential of a nuclear bomb going off in Los Angeles. He also talked about his being well aware that many college students have turned it into a drinking game, taking a shot whenever Jack says dammit. As the kid walked off, and the next questioner approached the microphone, Kiefer grabbed his own mic and yelled, "Dammit, Cameron, don't you walk away from me!" The crowd erupted -- it was fantastic. I have to say, Kiefer Sutherland seems like a really cool dude. As the event was closing up, he made a point to say how thankful he was for all of the fans of the show. Afterwards, with staffers trying desperately to get people out of the way, and get Kiefer out of the room, you could tell he didn't want to go. Even with event personnel trying to cajole him, he kept taking and signing as many things as people were stuffing in front of him, furiously trying to get it all done in a short time. By the time I got out of the 24 panel, the exhibit hall downstairs was almost closed. My friend had not gone to the panel with me, so I went looking for him. Turns out, he had managed to position himself right next to the G4 booth, as they were interviewing the two producers of Lost. His wife called him to tell him that every time the camera focused on Carlton Cuse, my friend could be seen right over his shoulder. Pretty awesome. First thing I did when we got back to the hotel that night -- recharge my camera. Saturday was the main day we had come for -- big-time panels on Heroes and Lost.